Sambar is a lentil stew popular in the cooking of southern India. It is generally made of yellow lentils (toor dal) simmered with tamarind-flavored water and a special blend of spices called sambar powder. Sambars commonly contain a variety of vegetables and are often finished off with more spices and curry leaves sautéed in oil. Sambar is especially popular as a breakfast dish, served with idli and vada. Place the toor dal, 3 cups of water and the turmeric in a saucepan over medium flame. Bring to a boil, then reduce heat to medium low and simmer until the dal is soft, 25 to 30 minutes. While the dal is cooking, mash the soaked tamarind into the soaking water to dissolve the pulp. Strain the tamarind water through a sieve to get out fibers and seeds. Mash the lentils up coarsely with the back of a spoon. 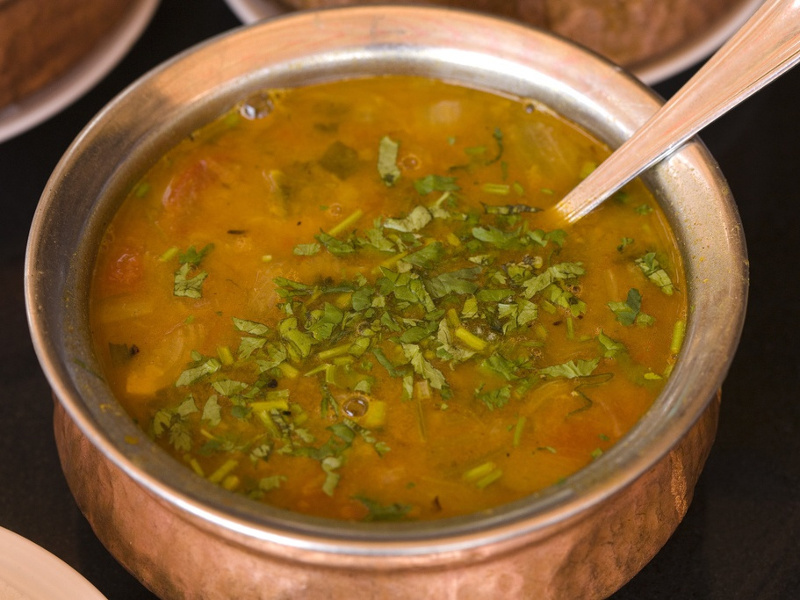 The sambar should take on the consistency of a thick soup. Stir the tamarind water, sambar powder and salt into the simmering dal and cook another 10 to 15 minutes. Add more water as needed to give the sambar the consistency of a thin pea soup. In another pan, heat the oil over medium flame. Add the hot chiles and mustard seeds and saute for about 30 seconds to toast the spices. Add the shallot or onions and sauté until just turning brown. Pour the flavored oil over the dal and serve. Vegetables are often added to sambar to make a nutritious stew. Add 1 or 2 cups of chopped tomatoes, potatoes, carrots, green beans, cauliflower, okra or pumpkin when you add the tamarind water and simmer until cooked through. Yellow split peas can be substituted if you can't find toor dal at a market near you. If you can't find tamarind pulp for the tamarind water, substitute 1/4 cup lemon or lime juice mixed with 3/4 cup water. Fenugreek seeds and curry leaves are often sautéed along with the chilies and mustard seeds for the flavoring oil. A pinch of asafoetida powder (hing) can be added with the sambar powder. Chopped cilantro can be stirred in at the end. Toasted and ground coconut is sometimes added along with the sambar powder. Add pinch of sugar or a drop of jaggery for a hint of sweetness. Sambar Podi (Sambar Powder): This special blend of spices can be found in most Indian stores. It is essential for the flavor of this dish. You can make your own if you can't find it pre-made. Adjust the spice amounts to your taste. Heat a dry skillet over medium flame. Add the whole spices and heat, stirring, until they take on a toasted aroma. Stir in the ground spices, remove from heat and grind to a powder in a spice grinder. Store in an airtight container. Traditionally, each ingredient is toasted separately before grinding together.